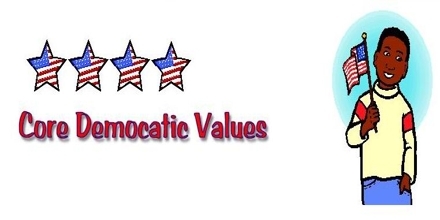 Core Democratic Values means; Citizens should work together for the good of all. The government should make laws that are good for everyone. Differences in languages, dress, food, where parents or grandparents were born, race and religion are not only allowed but accepted as important. Everyone should get the same treatment regardless of where their parents or grandparents were born, race, religion or how much money you have, citizens all have political, social, and economic equality.